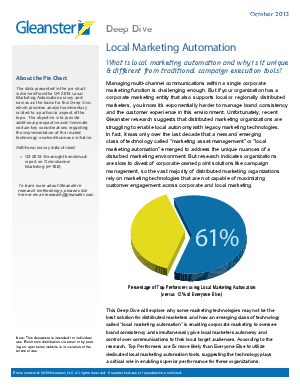 What is Local Marketing Automation? There are a variety of ways vendors position these tools: marketing asset management, distributed marketing, multi-channel distributed marketing, regional marketing platforms, and marketing operations. In some sense, vendors struggle to market these technologies because most marketers don’t exactly think of their environment as disturbed or local – or even something that demands “asset management.” That’s because disturbed marketers have the exact same challenges as every other organization. How do you engage a target audience with just the right message, at just the right time, in just the right channel? The problem is, in a disturbed environment there are two unique constituencies trying to meet this challenge: corporate marketing and local/regional marketers. Point solutions like campaign management and marketing automation are not designed to make the brand scalable for both stakeholders.